"Initially the flight played out fairly well, picking up wind under the wings and maintaining the same two-story height advantage for some distance. Halfway across busy Arlington Street though, the craft began slowing and losing forward momentum. It began dropping altitude rapidly, eventually crashing into the porch and partway through the front windows of the house across the way. Other than a few bruises and a wrecked machine, nothing was broken, although as it turned out, my dad wasn't nearly as proud of me as intended. I never forgot the thrill of that flight and carried that thrill and Leonardo's dreams into my adulthood." Five years before the record breaking flight by the Wright Brothers, Otto Lilienthal had already made hundreds of successful flights over huge distances using a series of 18 creations of his own design, of which 15 were single-wing mono planes and 3 bi-planes. Even though through research it is possible to find all 18 of the Lilienthal craft he designed and flew given numbers such as Type 10, Type 11, etc., he himself did not number them. The number designations system that has come down to us was a product of a man named Gerhard Halle, the son-in-law of Lilienthal's brother Gustav. 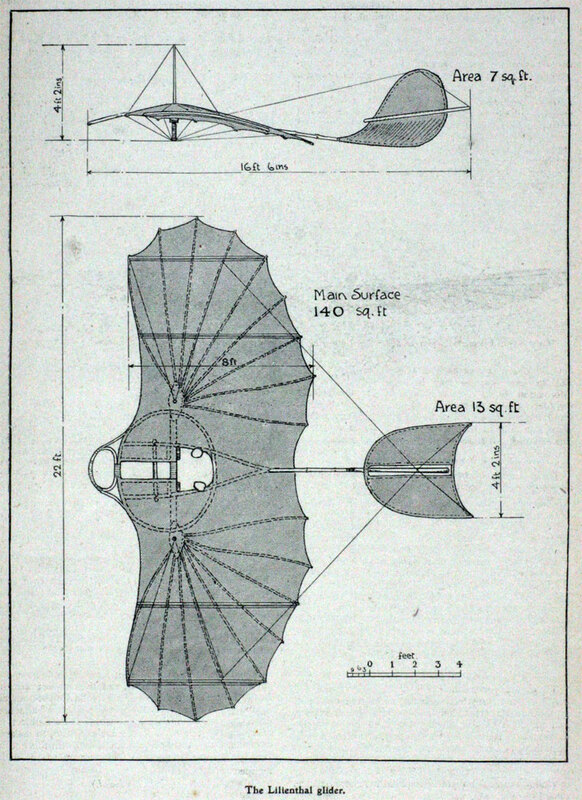 The final pattern for the flying machine, or glider as the case may be, that my Uncle and I selected and built, that I then took and flew without his knowledge or authorization, was extrapolated almost exclusively from a Lilienthal design, more specifically a model designated as Type IX or Number 9. In researching Lilienthal back in the 1948 era we are talking about here, my uncle and I were able to come up with a number of photographs of a number of his craft, but none specifically suitable for use to design one of our own from other than generally. In seeking an answer to our dilemma we ran into a man that informed us he had a solution that he was sure would solve our problem. The man was from England and in pursuit of satisfying his smoking habit he preferred British cigarettes. It just so happened the brand that he liked the most was made by a company called Lambert & Butler, a company that had for years, as a sales promotion published and distributed a rather fine series of collectable trading cards similar to America's baseball cards, although in any manner of subjects. 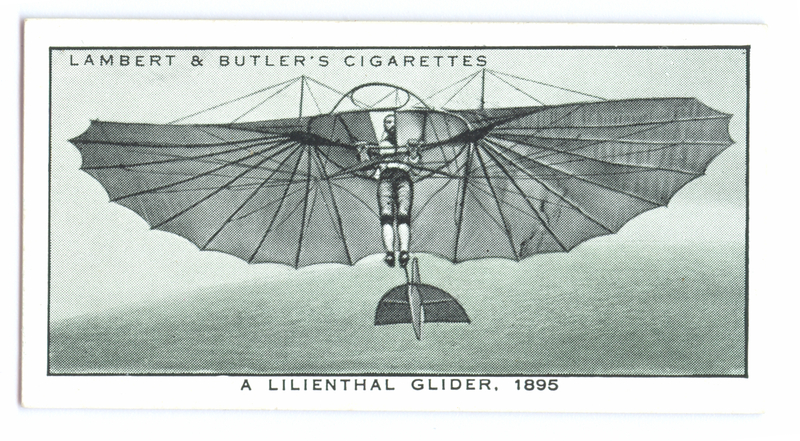 One day in a smoke shop that catered almost exclusively toward the sale of British cigarettes, cigars, and pipe tobacco that my uncle frequented on occasion, the man noticed a model of the glider I was carrying. When he commented on it I told him my uncle and I were building a life size one that I would be able to fly. Holding the model glider and looking it over carefully he said that what we were trying to accomplish seemed a noble and commendable venture, then questioned how far along we were in our endeavors. Listening intently to my tale of woe on how we had gone from a rather primitive glider based on one I saw in Tarzan and the Huntress to investigating Leonardo Da Vinci to Lilienthal and still were unable to come up with a successful craft. That is when the man said he might be able to help. Telling my uncle and me that he would be right back he took off running out of the shop. A half and hour went by. Then 45 minutes. My uncle said we had to go and just as we were leaving the man came running in carrying what looked like a photo album. Inside was page after page of what looked almost like baseball trading cards, only larger, and the theme wasn't ball players but airplanes. The cards were part of a collection he had saved for years that were at one time distributed by the aforementioned British cigarette maker Lambert & Butler. He flipped through the pages and came across a trading card that depicted the most beautiful glider I had ever seen. If I would have been older I would have ejaculated all over myself on the spot. It was perfect. The man gave the card to my uncle and told him he could use it if we wanted to make our plans from. Which is exactly what we did. My uncle was somehow able to search down the wingspan of the actual craft and from that we upscaled the rest of the measurements from the card to life size. As it so happened, the one depicted on the trading card was Lilienthal's Type 9. Not knowing it was a Type 9 and, even though my uncle and I researched everything we could regarding the flying craft depicted on the trading card by comparing what few photographs and drawings we could find, most of our interest circulated around the physical specifics --- that is the dimensions of the wingspan like length and width for instance. So, taking the graphic on the trading card as being accurate, we duplicated the craft's length, width, etc. in real life. What we didn't know was that it was a No. 9 or No. 9s history, of which for the most part there wasn't any --- and for good reason. Glider No. 9 was the same model that Lilienthal had his most serious crash, that is, up until the one that resulted in his death. In flight, at 60 feet above the ground, the No 9 glider stalled, followed by a steep nose-dive burying the front end of the craft in the ground with the only thing saving him being a sort of bumper called a "rebound bow" he began using in his designs. "One day I took the completed craft to the top of a nearby two story building and holding on for dear life, jumped off. At first the flying machine held fairly steady, maintaining altitude and covering a rather substantial distance. Then suddenly the craft stalled, I lost control and it dropped like a rock from a pretty good height, crashing into the front porch and through the windows of neighbor's house across the street. The machine escaped any real major damage and so did I. "Even though the flight ended not as smoothly as I hoped, primarily because of lack of experience on my part, or as the case may be, none at all, and as I discovered, perhaps the lack of any sort of actual flight control mechanisms as well, I considered my attempt a success --- especially so because of the distance covered before I lost control." The thing is, the day I jumped off the two story building it never even entered my mind that I might need a landing spot or anything else for that matter. Even though I knew Cheetah the Chimp's glider crashed in the movie and Leonardo's did in the comic book, I just expected my glider, which was much more sophisticated, to continue staying afloat in the air until I decided to set it down. For all I knew, at least in how I viewed things in my then ten year old mind, I could have flown the thing clear to the Pacific Ocean some 15 to 20 miles to the west. "During a gliding flight taken from great height the center of gravity lay too much in the back; at the same time I was unable, owing to great fatigue, to draw the upper part of my body again toward the front." Although I didn't know it at the time, and have only since found out through recent research, as you can see by what I have written above almost the exact same results happened to me when I attempted to fly the craft my uncle and I built. If it was caused by something inherent in the design or simply a coincidence between Lilienthal's flying ability and mine is something I will never know. He never flew the Type 9 again and, even though I wish I had flown mine again --- like Leonardo Da Vinci always moving on to other things --- neither did I. There is a slight caveat to my "never attempted another similar human-powered flight after that" found in the above quote. That caveat circulates around the word "similar." I did have two clearly defined attempts at human powered flight after the one described above --- one successful, the other ending in another crash. The second attempt occurred 17 years after the first as found in Washoe Zephyr and the third occurred 30 years after the first as found in The Zen Man Flies. "When my uncle and I first started looking into the possibility of a glider-like flying machine, after a quick mock-up and test of a near replica of a Tarzan and the Huntress version, although I loved it, we almost instantly discarded it for a more sophisticated less primitive type." Although I had been known from very early age to jump off one-story porches, garages, and roof tops with a bed sheet made into a parachute or flaring behind my back tied to my wrists and ankles a la Captain Midnight's glider chute on more than one occasion, my very, very first serious attempt to build a functional airplane-like craft that would carry me in flight was based almost exclusively on a glider I saw as a young boy in the 1947 black and white movie Tarzan and the Huntress as seen above, except for a few slight modifications.